Sirte, Libya, Thursday, Sept. 29, 2016. Manu Brabo/AP/Press Association Images. All rights reserved.On 20 October 2011, former Libyan leader Colonel Muammar Qadhafi was dragged out of his sewage-pipe hideout to meet his inglorious end. Five years on and things in Libya couldn’t be much worse. There is still no centralised authority; killing, abduction and torture are rife; the economy is almost on its knees; and the country has fragmented beyond repair. The triumphalism that accompanied Qadhafi’s removal from power can hardly have been more misplaced. Much of the chaos that has enveloped the country is down to the Libyans themselves. The blame for the incessant squabbling and local turf wars that have eclipsed all sense of a national good must be laid squarely at the door of Libya’s new powerbrokers. There is also the legacy of forty years of rule by a ruthless dictator whose uncompromising vision of the state stripped the country of functioning institutions and its population of a political culture. In addition, the sudden toppling of a highly centralised authority was always going to mean that the country would struggle to get back on its feet. But the international community has played a poor game too and must shoulder some of the responsibility for what has gone wrong since 2011. Aside from the rights and wrongs of the Nato intervention itself, western states since the ousting of the former regime have pursued a muddled and shortsighted policy that has made a bad situation worse. From its pushing for parliamentary elections to be held less than a year after Qadhafi’s collapse, in a country where there were no established political parties let alone institutions to support the instruments of government; to its turning a blind eye to the atrocities being committed by the hotchpotch of newly empowered revolutionaries that had ejected Qadhafi; to its courting of local powerbrokers while simultaneously supporting the rebuilding of a centralised authority – the international community has done little to help Libyans either reconcile with their past or build a state (see "Libya: tests of renewal", 2 June 2012). Where the international community has arguably done most damage, however, is through its backing of a clunky and ill-conceived peace process, the culmination of which has been the imposition on the country of a "consensus" government that is anything but. A flawed peace processThe United Nations-sponsored peace process was launched in September 2014 after Libya had split into two competing political authorities. In the west of the country was the General National Congress that was supported by an array of militias from Misrata, the capital and other western towns. These forces, many of them Islamist in orientation, had come together in the summer of 2014 to force their opponents out of the capital. In the east was the newly elected House of Representatives, which was recognised internationally as Libya’s legislative power and that had allied itself to a retired army officer, Khalifa Haftar, who had gathered a ragtag collection of forces around himself and who was slugging it out against Islamist militants in Benghazi. Both the House and the Congress insisted that they were the country’s sole legislative authority and battled it out for control of Libya’s resources and national institutions.The UN peace process that was meant to bring these competing forces together may have been well-intentioned, but it was flawed from the start. Most importantly it pulled in the wrong actors, holding endless dialogue sessions between representatives of the House of Representatives and the General National Congress despite the fact the neither of these institutions had any real clout on the ground. Rather, both were always at the behest of the military and revolutionary powers that were driving the conflict. In addition, throughout the long and fraught negotiation process, the UN appeared to flip-flop between the two sides, seemingly favouring one party and then the other. It repeatedly amended the text of the political agreement in line with the wishes of whichever side was threatening to boycott the process at any one time. While this was simply a reflection of the UN’s desperation to get a deal signed, as the number of draft agreements piled up, it was accused by both sides of being partisan. The UN didn’t help itself either when in October 2015 and in a bid to meet its own deadline, it tried to pull the rug from under both parties by announcing a unity government of its own. Predictably enough its doing so provoked angry accusations that it was violating national sovereignty and it was forced to retract. All this meant that when a political agreement was eventually signed in December 2015, it was not only missing the endorsement of the powers that mattered, it was viewed as something that had been imposed from the outside. Plus, in the interests of actually getting something signed, the agreement had put the thorniest issues conveniently to one side. The Daesh factorYet at this point western powers hardly seemed to care. The emergence of Daesh, which took over Sirte in February 2015, had created a new imperative in western policymaking circles and the overriding preoccupation became how to establish some sort of consensus government that could sanction foreign military intervention against the group. Thus getting an agreement in place was more important than the agreement itself.To some Libyans, this was perplexing. Despite all the hysteria in the western media about Daesh in Libya, the reality was that while certainly repugnant, the group was limited to a small area and was proving unable to expand in any meaningful way. Indeed, there was a series of structural and societal factors in Libya, including the country’s tribes, which were always going to impede Daesh’s growth. For many Libyans, therefore, Daesh was the least of their problems. Yet the international community persisted, and railroaded Libya into signing the December 2015 political agreement and establishing a new government, or at least a Presidency Council that could endorse its intervention. But this Presidency Council was not fit for purpose. Comprising a group of weak and bitterly divided individuals, chosen by virtue of which region of Libya they came from rather than what they could offer the country, this council had absolutely no power or credibility on the ground. Little surprise, therefore, that when it arrived in Tripoli in March 2016 this Council was already dead in the water. Since then its legitimacy has been eroded further as it has proved utterly incapable of getting a grip on the morass of militias that still call the shots. It has been unable, too, to tackle the myriad of problems facing ordinary Libyans such as the lack of services, fuel shortages, price hikes and the non-payment of salaries. In October 2016, even the Council’s own Presidential Guard revolted against it in protest at not having received their wages. The Guard conspired with other hostile forces in the capital, including the head of the Congress’s government, Khalifa Ghweill, to take over all government buildings. It is little wonder that the Presidency Council has been plagued by accusations that it is ignoring the needs of Libyans in order to serve a foreign agenda that has prioritised combating Daesh at the expense of the Libyan state. Empowering whom?As far as the fight against Daesh is concerned, the international community is on the way to achieving its objectives. 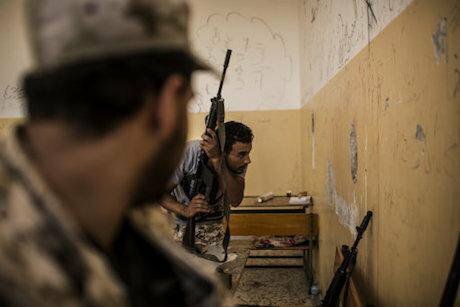 The group is almost defeated in Sirte and its days in Libya are clearly numbered. However, through this battle, western states have ended up empowering an array of militias who may have been willing to harness themselves to the Presidency Council, but who certainly are not under its control. These militias have been willing to fight on the Presidency Council’s behalf in what has been an opportunistic bid to consolidate their own power and gain recognition as Libya’s official state forces. Notably, some of these forces that have been bolstered in this way are themselves militant Islamist in orientation. While their ideology may not be as extreme as that of Daesh, they adhere to an extremist agenda nonetheless. But that’s not all. Through its fight against Daesh, the international community has also strengthened the regional power of Misrata, which has led the struggle against the group. This has fed directly into regional tensions that cut right to the heart of the Libyan conflict. Indeed, the main powers in the east, namely Haftar and the eastern tribes that support him, are still rejecting the political agreement and the Presidency Council it has spawned. By continuing to back the Presidency Council without these important forces on board, the international community looks as though it is backing one side in Libya’s conflict. The situation is made worse by the fact that the House of Representatives has yet to give its official backing to the political agreement, meaning that in the eyes of many, the Presidency Council is not yet a legal entity.However, the international community’s policy is even more muddled than the above would suggest. All the while that it has been chiding Haftar and his associates for rejecting the political agreement and calling on them to give it their backing, certain western states have been providing them with covert military assistance in their bid to quash Islamist militants in Benghazi. France has openly acknowledged that it has military personnel stationed in the east of Libya, while there have been numerous reports of British and American special forces present there too. This means that the international community has ended up facilitating Haftar’s fight against Islamist militants in the east of Libya, while simultaneously supporting Islamist militias in the west. It is little wonder that there are growing calls inside Libya for an end to foreign intervention and for a purely Libyan-Libyan peace process. While these demands may be little more than bluster by some of the parties in the conflict, they reflect the damage that the international community has done to its own credibility in Libya. Indeed, its shortsighted policy has fuelled perceptions that it is duplicitous and self-serving, and that it has failed the people upon whose behalf it claimed to have intervened in 2011.A Libyan tragedyBut the tragedy for Libya is that as this peace process has dragged on, the country has descended into ever deeper chaos and despair. It has also found itself dragged back down the path of military rule. Over recent weeks, Haftar, who seized control of four eastern oil ports in September, has moved to consolidate his power by appointing military commanders to replace elected local councils. He has also appointed military men to take over the running of a number of state-owned companies. And in a media interview at the end of September, Haftar, who has often been accused of fashioning himself on Egypt's president, Abdulfattah Al-Sisi, and who is clearly positioning himself as the strongman who can save Libya, declared: “Military people who were elected to lead their country achieved remarkable success.” In response to this militarisation in the east, the militias and military councils in the west of Libya are sharpening their swords, preparing themselves for the possibility of another big showdown with Haftar’s allies in the capital. For all the peace process of the past year, therefore, Libya is still caught in the bind of the same old forces that brought the country to its knees in the summer of 2014. Thus while Libya may be on its way to defeating Daesh, it is certainly no nearer to peace, let alone to the civil state that so many dreamed of when they rose up against Qadhafin in 2011. While no one is pretending that dealing with Libya is easy, the international community should at least be asking itself some difficult questions about the role it has played.